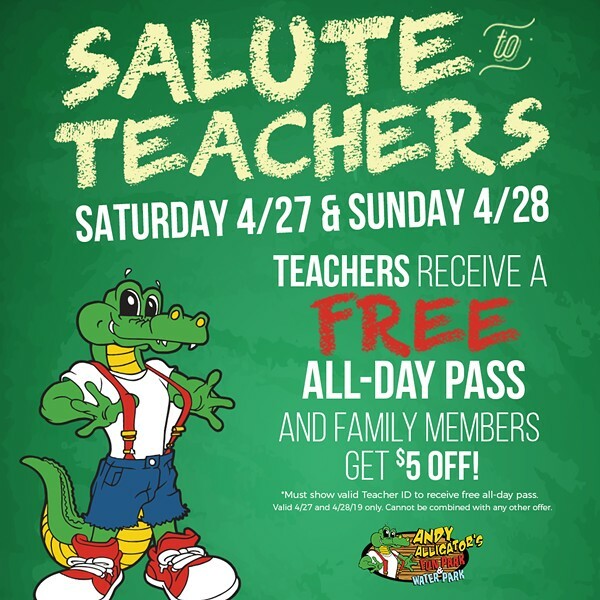 When: Sat., April 27, 10 a.m.-11 p.m. and Sun., April 28, 11 a.m.-9 p.m.
Andy Alligator's is celebrating teachers! On Saturday, April 27th and Sunday, April 28th, teachers with a valid ID will receive a FREE All-Day Pass and $5 off for each family member! An All-Day Pass includes unlimited Go-Karts, Climbing Wall, Rookie Karts, Frog Hopper, Bumper Cars, one round of Laser Tag and the Kidz Zone.